The school year begins on September 1st. Classes follow, starting on the 2nd of September, when schedules are handed out at breakfast. Hogwarts Express departs from King's Cross Station promptly at 11 a.m., headed to Hogwarts where 2nd through 7th years ride horseless carriages up to the school. 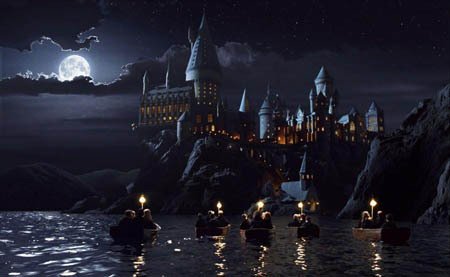 1st year students cross the lake in boats with Hagrid. Quidditch trials are held during the 2nd week of school with the first match being held in the beginning of November. However first years are not allowed to try out. Additionally, flying lessons begin at the same time for 1st year students. The Halloween Feast is on the evening of October 31, and is usually accompanied by bats flying around the ceiling of the Great Hall as well as loads of sweets and drinks. During the second week of December, Professor McGonagall takes the names of those students remaining at the school over the Christmas holidays. A week before Christmas, those students and teachers who are returning home board the Hogwarts Express, while the rest remain at school for the Christmas Feast on Christmas day. Students and Teachers return for classes on January 1st. The next holiday is Easter, at which some students go home. The dates vary each year. Exams are given on the first week of June, with results coming back the second week of June. The Leaving Feast, often referred to as the end-of-term feast, is held the evening before the Hogwarts Express makes the trip back to London during the third week of June. During the summer break, all staff and students leave Hogwarts. Except for Filch. Someone has to clean up after you lot! Each day begins with a hearty breakfast in the Great Hall, during which mail arrives in a flurry of owls. Afterwards, a bell signals the start of the first class of the day. There are two morning classes, with a break between each, followed by lunch at noon. At 1pm, the students return to class for their two afternoon classes. Each also with a break between them. Dinner is served in the Great Hall after the last class of the day lets out and afterwards, students are expected to be in their House common rooms for studying and socializing. There there are some who just can't stay put. There is no set bedtime after supper, though all students are encouraged to ensure they get enough sleep for the following day's classes. All 1st year Gryffindors have Friday afternoons off at the ruling of their Head of House. A long black cloak, emblazoned with the badge of your House. A grey sweater, with the neckline trimmed in House colors. A tie in matching House colors. A pair of grey pants for boys. A knee-length grey skirt for girls. NOTE: The clothes are magically enchanted so that the appropriate house colors are shown. Incoming, unsorted, First years wear the same attire, except they do not have the House colors. Following Sorting, the clothes are cast a spell to make the enchantment show the colors. NOTE: In the aftermath, some classes are missing their regular professors. Remaining faculty will divide class-duties between themselves until either the professor of record returns or a replacement can be found. In every student's fifth year, they take the OWLs. Results of these exams determine what courses the students will continue taking through their sixth and seventh years, when they take their NEWTs. Some professors are stricter than others as to what grade they will allow into their NEWT level classes. Each year, new First Year students to Hogwarts go through what has commonly been called 'The Sorting Ceremony'. Each student is called forward, and then the Sorting Hat is placed upon their head. The Sorting Hat is enchanted to judge the student's character and personality to determine what house they should be sorted into. NOTE: If you are unsure about which House your character may fit into, then set your House in Chargen to 'Unsure' and staff will determine a House for you based on your background. The rules for Hogwarts mirror those of the standard British school system and are probably just good common sense for school-aged children. What does this mean? PDA's (Public Displays of Affection) are frowned upon, and could possibly result in the involved students receiving detention if discovered. Smoking is not allowed anywhere. If a student is caught, detention will be given and the student's parents notified. Respect is expected towards other students and especially faculty. There are likely other rules, and this file will be expanded as they come up in the play of the game. Each house has its own Quidditch team. Quidditch is a game for wizards that involves several skills. Broomstick flying, hand and eye coordination, and strategy. Quaffle - Large, red, with indentions for holding onto it. Bludger - Medium-small iron balls enchanted to fly through the air and fly at players on the field. Snitch - Small, walnut-sized ball with wings enchanted to dart around the field and area. Chasers - Three chasers pass the quaffle between each other and try to get it through one of the three tri-level hoops at the end of the pitch. Keeper - This person guards the tri-level hoops on their team's side of the field to prevent the opposing chasers from scoring. Beaters - These two players are armed with small, thick bats and have the job of hitting the Bludgers to try and distract or disrupt the opposing teams players. Seeker - This one person has the most important task in the game. They have to locate and catch the Snitch. If they do, they win the game for their team. When the Snitch is caught - 150 points to the team of the Seeker who caught it.